Found it! This no-helmet bike lane marker is in Golden Gate Park. When I last went out photographing bike lane markers I could only find the ones with helmets, despite the fact that the whole endeavor was cued by Family Ride‘s mention of Seattle’s only without-helmets bike lane marker, which she refers to as Amsterdamize. I had a recollection there were some in San Francisco but couldn’t remember where. But success! I recently found some on the Music Concourse at Golden Gate Park. Then I saw more of them in the Presidio. Bike lane markers without helmets are apparently confined to parks in San Francisco. I guess the city only feels the need to encourage helmet use on gritty streets. Is this the reason some people carry helmets rather than wearing them? 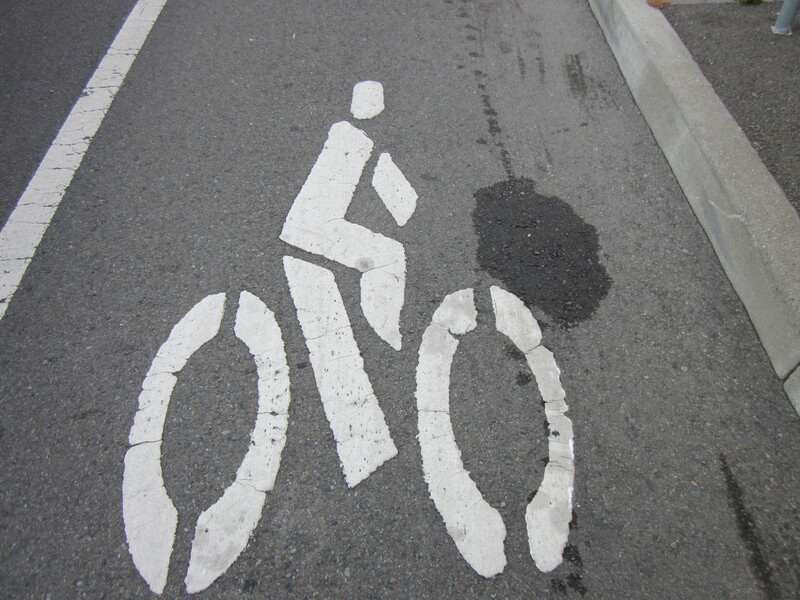 I still think that the bike lane markers showing riders wearing “helmets” should actually look like riders wearing helmets rather than riders who happened to find frisbees stuck on top of their heads. But maybe that’s just me. Here in the Peninsula/South Bay, the only bike lane markers that have riders with helmets are the ones at Stanford–the only place where no one wears helmets. Go figure.